Mega Millions is not content with dishing out the record-breaking USD657 million jackpot - it wants even more astronomical prize pots for its fans. The popular US lottery will be implementing system changes aimed at creating more winners and offering larger winnings starting Tuesday, October 22nd. The first 5 numbers will now be drawn from a pool of 75 numbers (yes 1 to 75) up from the former 56 balls. The Mega number will be easier to hit since tehre will now only be 15 numbers to choose from (1 to 15) down from the previous 46. The changes have increased the odds of winning a cash prize to 1 in 15 from the previous 1 in 40. The best thing about all of these is that there will be no increase in the cost of Mega Millions tickets. Here's Your Shot at a Dream: Enter and Win the Japan Jumbo Draw this August! Besides anime, manga,sushi and all things techie, the Japanese also love to gamble with a passion. They've had takara-kuji, or games of fortune for centuries - way ahead of other cultures. It played a significant role in the nation's rebuilding after the war ravaged much of Japan. It may have undergone dozens of different small changes but lotteries in Japan are definitely staying for good. The most popular of the Takara-kuji lottos is the Japan Jumbo Draw. It has earned for itself a reputation as the richest lottery draw in Asia. It's second to the El Gordo draw of Spain as the richest lottery draw in the world. The next Japan Jumbo draw is scheduled to take place in August 2013. Here are the details for the Japan "Summer" Jumbo Draw. It was only recently that Japan Jumbo Draw opened its doors to non-Japanese players. So this is in fact a unique opportunity that should be taken advantage of - while tickets last! 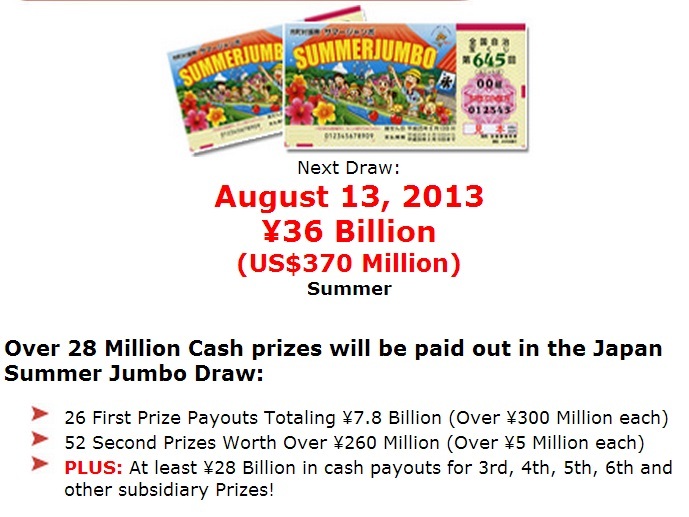 Through the assistance of OSA, you can now join the Summer Jumbo Draw and win Over 28 Million Cash prize. Please note though that Tickets for overseas players are limited, and must be reserved well in advance. 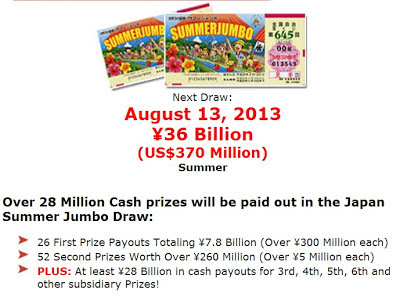 Deadline for ordering tickets to the Japan "Summer" Jumbo Draw is before August 2, 2013. Just go to www.japanjumbodraw.com for more information.